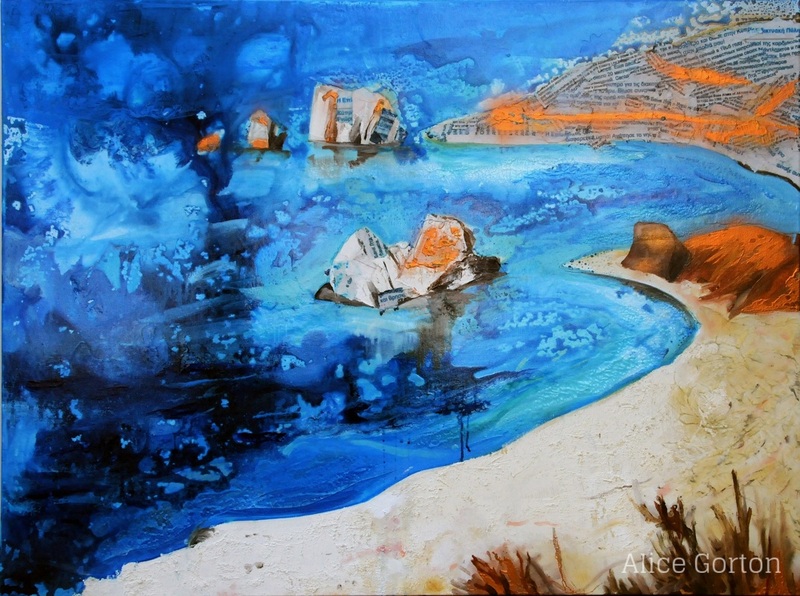 For this piece I wanted to capture the enthralling quality of the Mediterranean sea which has shaped the island as well as the cultural mix that I encountered. I used a lot of copper coloured pigment in this piece as Cyprus was famous in antiquity for its copper resources, the etymology of Cyprus and Copper are integrally and classically linked. The mineral copper was named after the island of Cyprus, being a corruption of the name "kyprios" in Greek, and Latin "cuprum" meaning copper. The Copper also adds a beautiful contrast to the blue and turquoise of the sea. I used texts from three languages to create the rough hillside. The Greek was from a Cypriot holiday website to show the pride of the native populous and how strong the tourism industry of the country is. The second language I have used is English, an excerpt from the "Delaration of the Sovereign Base Areas", as the British have a strategic military base on the island. The third language is Russian, partly due to the swell in Russian tourism in Cyprus and partly because of the R.C.B. (Russian Central Bank). I used the introduction to 'Banking Today' in Cyprus on their website as the text. Since the economic crash in Cyprus the R.C.B has been the second largest bank in Cyprus.